Milk secretion illustrates how organelles interact to synthesize, transport, store, and export biochemicals. Secretion begins in the nucleus (a), where messenger RNA molecules bearing genetic instructions for production of milk proteins exit through nuclear pores to the cytoplasm (b). Most proteins are synthesized on membranes of the rough endoplasmic reticulum (ER) (c), using amino acids in the cytoplasm. Lipids are synthesized in the smooth ER (d), and sugars are synthesized, assembled, and stored in the Golgi apparatus (e). 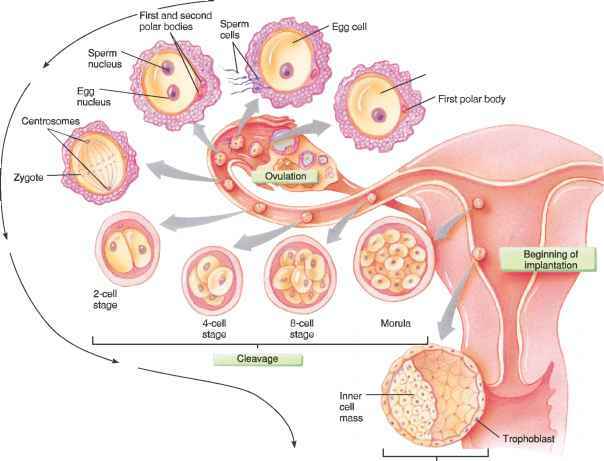 An active mammary gland cell releases milk proteins from vesicles that bud off of the Golgi apparatus (f). Fat droplets pick up a layer of lipid from the cell membrane as they exit the cell (g). When the baby suckles, he or she receives a chemically complex secretion — milk. glycoproteins to organelles within the cell (fig. 3.12). Movement of substances within cells by way of vesicles is called vesicle trafficking. Secretory vesicles that originate in the ER not only release substances outside the cell, but also provide new cell membrane. This is especially important during cell growth. What is a selectively permeable membrane? Describe the chemical structure of a cell membrane. What are the different types of intercellular junctions? What are some of the events of cellular adhesion? What are the functions of the endoplasmic reticulum? Describe how the Golgi apparatus functions. (a) A transmission electron micrograph of a mitochondrion (40,000x). (b) Cristae partition this saclike organelle. 4. Mitochondria. Mitochondria (micto-koncdre-ah) are elongated, fluid-filled sacs 2-5 ^m long. They often move about slowly in the cytoplasm and can divide. A mitochondrion contains a small amount of DNA that encodes information for making a few kinds of proteins and specialized RNA. However, most proteins used in mitochondrial functions are encoded in the DNA of the nucleus. These proteins are synthesized elsewhere in the cell and then enter the mitochondria. A mitochondrion (micto-koncdre-on) has two layers—an outer membrane and an inner membrane. The inner membrane is folded extensively to form shelflike partitions called cristae. Small, stalked particles that contain enzymes are connected to the cristae. These enzymes and others dissolved in the fluid within the mitochondrion control many of the chemical reactions that release energy from glucose and other organic nutrients. The mitochondrion captures and transforms this newly released energy into a chemical form, the molecule adenosine triphosphate (ATP), that cells can readily use (fig. 3.13 and chapter 4, p. 114). For this reason the mitochondrion is sometimes called the "powerhouse" of the cell. A typical cell has about 1,700 mitochondria, but cells with very high energy requirements, such as muscle, have many thousands of mitochondria. This is why a common symptom of illnesses affecting mitochondria is muscle weakness. Symptoms of these "mitochondrial myopathies" include exercise intolerance and weak and flaccid muscles. Mitochondria are particularly fascinating to biologists because they provide glimpses into the past. Mitochondria are passed to offspring from mothers only, because these organelles are excluded from the part of a sperm that enters an egg cell. Evolutionary biologists study the DNA sequences of genes in mitochondria as one way of tracing human origins, back to a long-ago group of ancestors metaphorically called "mitochondrial Eve." Mitochondria may provide clues to a past far more remote than the beginnings of humankind. According to the widely accepted endosymbiont theory, mitochondria are the remnants of once free-living bacteria-like cells that were swallowed by primitive eukaryotic cells. These bacterial passengers remain in our cells today, where they participate in energy reactions. In this falsely colored transmission electron micrograph, lysosomes appear as membranous sacs (14,100x). acids, including foreign particles composed of these substances. Certain white blood cells, for example, engulf bacteria that are then digested by the lysosomal enzymes. This is one way that white blood cells help stop bacterial infections. Lysosomes also destroy worn cellular parts. 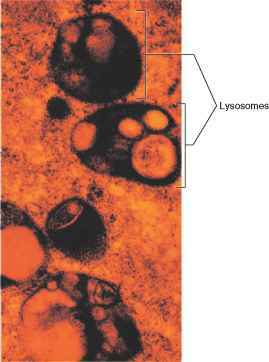 In fact, lysosomes in certain scavenger cells may engulf and digest entire body cells that have been injured. How the lysosomal membrane is able to withstand being digested itself is not well understood, but this organelle sequesters enzymes that can function only under very acidic conditions, preventing them from destroying the cellular contents around them. Human lysosomes contain forty or so different types of enzymes. An abnormality in just one type of lysosomal enzyme can be devastating to health (Clinical Application 3.3). 6. Peroxisomes (pe-roksci-somz). Peroxisomes are membranous sacs that resemble lysosomes in size and shape. Although present in all human cells, peroxisomes are most abundant in the liver and kidneys. Peroxisomes contain enzymes, called peroxidases, that catalyze metabolic reactions that release hydrogen peroxide (H2O2) as a by-product. Peroxisomes also contain an enzyme called catalase, which decomposes hydrogen peroxide, which is toxic to cells. Abnormal peroxisomal enzymes can drastically affect health. 7. Centrosome. A centrosome (senctro-som) (central body) is a structure located in the cytoplasm near the nucleus. It is nonmembranous and consists of two hollow cylinders called centrioles built of tubelike proteins called microtubules. The centrioles usually lie at right angles to each other. During cell division the centrioles move away from one another to either side of the nucleus, where they form spindle fibers that pull on and distribute chromosomes, (krocmo-somz) which carry DNA information to the newly forming cells (fig. 3.15). Centrioles also form parts of hairlike cellular projections called cilia and flagella. 8. Cilia and flagella. Cilia and flagella are motile extensions of certain cells. They are structurally similar and differ mainly in their length and the number present. Both consist of a constant number of microtubules organized in a distinct cylindrical pattern. Cilia are abundant on the free surfaces of some epithelial cells. Each cilium is a tiny, hairlike structure about 10 ^m long, which attaches just beneath the cell membrane to a modified centriole called a basal body. Cilia occur in precise patterns. They have a "to-and-fro" type of movement that is coordinated so that rows of cilia beat one after the other, producing a wave that sweeps across the ciliated surface. For example, this action propels mucus over the surface of tissues that form the lining of the respiratory tract (fig. 3.16). Chemicals in cigarette smoke destroy cilia, which impairs the respiratory tract's ability to expel bacteria. Infection may result. (a) A transmission electron micrograph of the two centrioles in a centrosome (142,000x). (b) Note that the centrioles lie at right angles to one another. (a) Cilia, such as these (arrow), are common on the surfaces of certain cells that form the inner lining of the respiratory tract (10,000x). (b) Cilia have a power stroke and a recovery stroke that create a "to-and-fro" movement that sweeps fluids across the tissue surface. base. The tail of a sperm cell, for example, is a flagellum that causes the sperm's swimming movements (fig. 3.17 and chapter 22, p. 888). 9. Vesicles. Vesicles (vescfc&iz) (vacuoles) are membranous sacs that vary in size and contents. German physiologist Rudolph Virchow first hypothesized cellular pathology —disease at the cellular level —in the 1850s. Today, new treatments for many disorders are a direct result of understanding a disease process at the cellular level. Here, we examine how three abnormalities — in mitochondria, in peroxisomes, and in lysosomes—cause whole-body symptoms. Sharon had always been small for her age, easily fatigued, slightly de-velopmentally delayed, and had difficulty with schoolwork. She also had seizures. At age eleven, she suffered a stroke. An astute physician who observed Sharon's mother, Lillian, suspected that the girl's symptoms were all related, and the result of abnormal mitochondria, the organelles that house the biochemical reactions that extract energy from nutrients. The doctor noticed that Lillian was uncoordinated and had numb hands. When she asked if Lillian ever had migraine headaches, she said that she suffered from them nearly daily, as did her two sisters and one brother. Lillian and her siblings also had diabetes mellitus and muscle weakness. Based on this information, the doctor ordered several blood tests for mother and daughter, which revealed that both had elevated levels of bio-chemicals (pyruvic acid and lactic acid) that indicated that they were unable to extract the maximal energy from nutrients. Muscle biopsies then showed the source of the problem—abnormal mitochondria. Accumulation of these mitochondria in smooth muscle cells in blood vessel walls in the brain caused Sharon's stroke and was probably also causing her seizures. All of the affected family members were diagnosed with a disorder called MELAS, which stands for the major symptoms — mitochondrial encepha-lomyopathy, lactic acidosis, and strokelike episodes. Their mitochondria cannot synthesize some of the proteins required to carry out the energy reactions. The responsible gene is part of the DNA in mitochondria, and Lillian's mother transmitted it to all of her children. But because mitochondria are usually inherited only from the mother, Sharon's uncle will not pass MELAS to his children. For young Lorenzo Odone, the first sign of adrenoleukodystrophy was disruptive behavior in school. When he became lethargic, weak, and dizzy, his teachers and parents realized that his problem was not just temper tantrums. His skin darkened, blood sugar levels plummeted, heart rhythm altered, and the levels of electrolytes in his body fluids apparatus and ER also form vesicles. Fleets of vesicles transport many substances into and out of cells in vesicle trafficking. 10. Microfilaments and microtubules. Two types of threadlike structures in the cytoplasm are microfilaments and microtubules. Microfilaments are tiny rods of the protein actin that typically occur in meshworks or bundles. 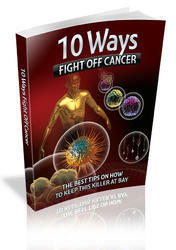 They cause various kinds of cellular movements. In muscle cells, for example, microfilaments constitute myofibrils, which cause these cells to shorten or contract. In other cells, microfilaments associated with the inner surface of the cell membrane aid cell motility (fig. 3.18). Microtubules are long, slender tubes with diameters two or three times greater than those of microfilaments. They are composed of the globular protein tubulin. Microtubules are usually somewhat rigid and form the cytoskeleton, which helps maintain the shape of the cell (fig. 3.19). In cilia and flagella, microtubules interact to provide movement (see figs. 3.16 and 3.17). Microtubules also move organelles and structures within the cell. For instance, microtubules are assembled from tubulin subunits in the cytoplasm during cell division and help distribute chromosomes to the newly forming cells, a process described in more detail later in this chapter. Microtubules also provide conduits for organelles, like the tracks of a roller coaster. 11. Other structures. In addition to organelles, cytoplasm contains lifeless chemicals called inclusions. These usually are in a cell temporarily. Inclusions include stored nutrients such as glycogen and lipids, and pigments such as melanin in the skin. changed. He lost control over his limbs as his nervous system continued to deteriorate. Lorenzo's parents took him to many doctors. Finally, one of them tested the child's blood for an enzyme normally manufactured in peroxisomes. Lorenzo's peroxisomes lacked the second most abundant protein in the outer membrane of this organelle. Normally, the missing protein transports an enzyme into the peroxisome. The enzyme controls breakdown of a type of very long chain fatty acid. Without the enzyme, the fatty acid builds up in cells in the brain and spinal cord, eventually stripping these cells of their fatty sheaths, made of a substance called myelin. Without the myelin sheaths, the nerve cells cannot transmit messages fast enough. Death comes in a few years. For Lorenzo and many other sufferers of ALD, eating a type of triglyceride from rapeseed oil slows the buildup of the very long chain fatty acids for a few years, stalling symptoms. But the treatment eventually impairs blood clotting and other vital functions and fails to halt the progression of the illness. The disappointment over the failure of "Lorenzo's oil" may be lessened by a drug that activates a different gene, whose protein product can replace the missing or abnormal one in ALD. In cells from children with ALD, the replacement protein stopped the buildup of very-long-chain fatty acids, and also increased the number of peroxisomes. Michael was a pleasant, happy infant who seemed to be developing normally until about six months of age. Able to roll over and sit for a few seconds, he suddenly seemed to lose those abilities. Soon, he no longer turned and smiled at his mother's voice, and he did not seem as interested in his mobile. Concerned about Michael's reversals in development, his anxious parents took him to the doctor. It took exams by several specialists to diagnose Michael's Tay-Sachs disease, because, thanks to screening programs in the population groups known to have this inherited illness, fewer than ten new cases appear each year. Michael's parents were not among those ethnic groups and previously had no idea that they both were carriers of the gene that causes this very rare illness. A neurologist clinched her suspicion of Tay-Sachs by looking into Michael's eyes, where she saw the telltale "cherry red spot" indicating the illness. A look at his cells provided further clues—the lysosomes, tiny enzyme-filled sacs, were swollen to huge proportions. Michael's lyso-somes lacked one of the forty types of lysosomal enzymes, resulting in a "lysosomal storage disease" that built up fatty material on his nerve cells. His nervous system would continue to fail, and he would be paralyzed and unable to see or hear by the time he died, before the age of four years. Why are mitochondria called the "powerhouses" of cells? Describe the functions of microfilaments and microtubules. Distinguish between organelles and inclusions.